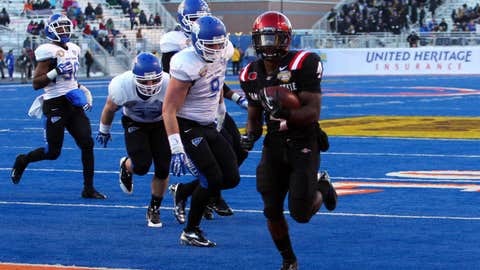 San Diego State running back Adam Muerma, who rushed for 230 yards, scores one of his three touchdowns against Buffalo in Saturday’s Famous Idaho Potato Bowl. BOISE, Idaho (AP) — Adam Muema rushed for 230 yards and three touchdowns and Quinn Kaehler tossed a pair of touchdowns as San Diego State rolled to a 49-24 victory over Buffalo Saturday in the Famous Idaho Potato Bowl. The Aztecs pulled away early, scoring three touchdowns in a 5:24 span stretching from the end of the first half into the third quarter. The scoring spree was fueled by two costly Buffalo turnovers, the first an interception just before halftime that set up Kaehler’s 25-yard touchdown toss to Dylan Denso. The Bulls then fumbled on the opening kick in third quarter. The Aztecs (8-5, 6-2 Mountain West Conference) scored five plays later when Kaehler fired an 11-yard TD to Adam Roberts to go up 35-10. Not much went right for the Bulls (8-5, 6-2 Mid-American Conference), playing in the second bowl game in the team’s 100-year history. Buffalo had three turnovers and just 309 total yards.